Good news! The NWF and Scotts have called it splitsville, which is especially good because all the facebook and twitter urging/activism I was doing was making me feel a bit obsessive. I was just *so* disappointed in them. The thing is, though, Scotts MiracleGro will continue to try "owning" the profitable realm of organics. While their corporate friend Monsanto will continue to "buy" rights to plants. Even if you aren't wary of GMOs, we risk losing the resulting joy of simply pushing a seed into the ground to watch it flourish. 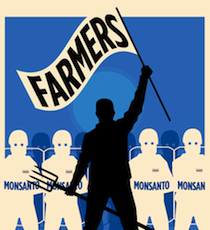 Farmers should be able to sue Monsanto, not just vice versa. Monsanto is more than represented in the FDA. And another, similar petition here.